It may have provided low-quality, grainy photographs, but TIROS-1, America's first weather satellite, was a boon to meteorologists and weather forecasters as it provided images of frontal systems and tropical storms at sea, far from surface observation posts. Over the course of the decade, more sophisticated weather satellites were launched, carrying additional sensors to measure global temperatures as well as to provide photographs of clouds. Meteorologists continued to actively research techniques for weather modification and to advance numerical weather prediction. While neither was living up to its advertised capabilities, both were in operational use by the end of the decade. Concerns about climate change were also heard during the 1960s. 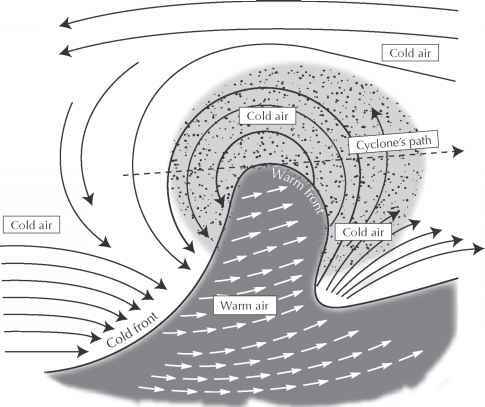 The meteorologist Edward N. Lorenz (1917- ), father of chaos theory, pointed out the chaotic nature of Earth's climate system and documented the possibility that climate could suddenly switch from glacial to interglacial and back. As meteorologists expanded their modeling efforts to describe climate, they continued to add more atmospheric variables to their calculations in an attempt to generate a more accurate picture of Earth's future atmosphere.